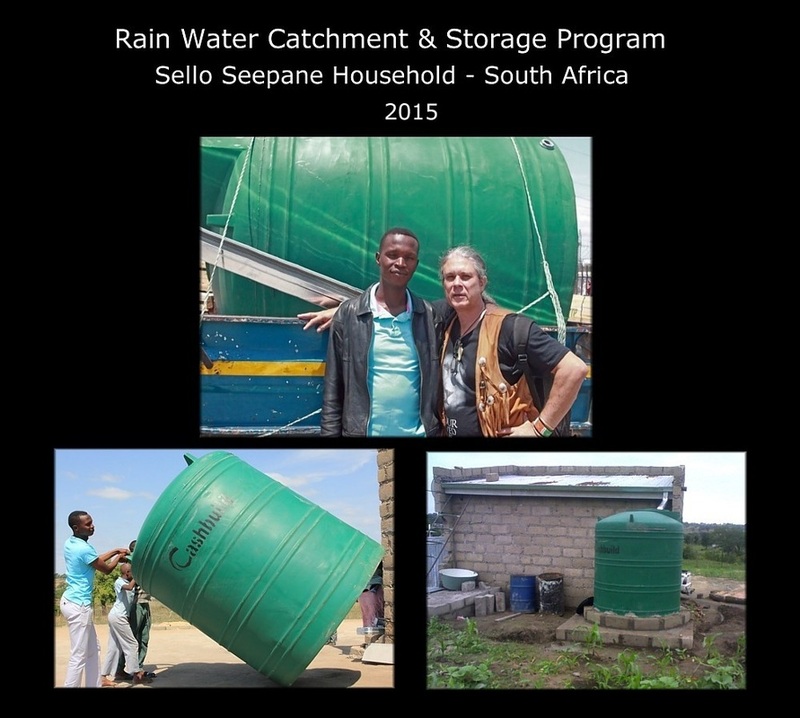 Plenty Canada has been continuing its water development work in South Africa with the installation of a new rain water catchment & storage system at Sello Sepane's household in Acornoek community of the Mpumalanga province, between the Kruger National Park and the Drakensberg mountains. Sello is an old friend and trainee of Mwana Bermudes, the field Project Coordinator in southern Africa. Sello's mother assisted Mwana to establish his bush cabin and project center located in the same region of South Africa, and as a trade off, she requested him to train her young son Sello in various basic skills so that he could eventually become self-sufficient. Sello is now married with two children and taking care of two nephews, making a living by working as a professional technician for road bridge construction all over the country. 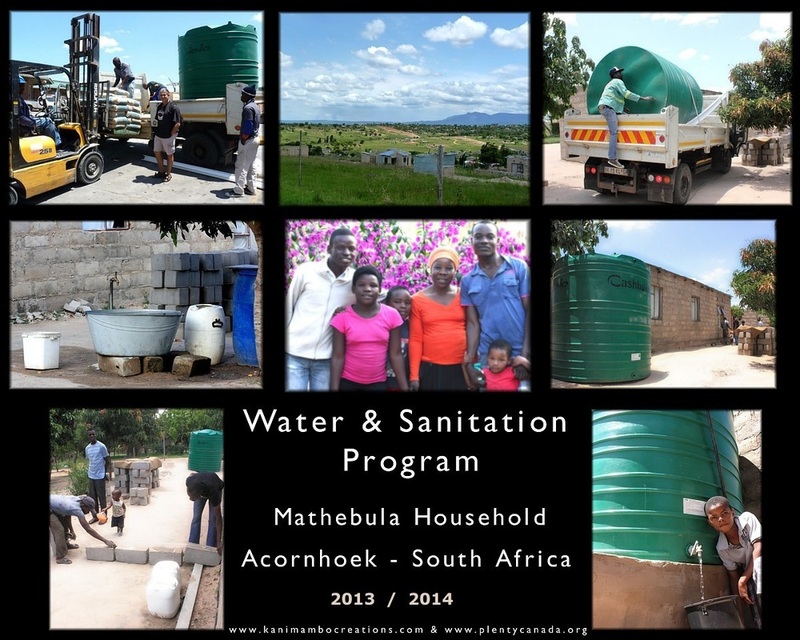 This is our third water system project in this South African community where both native tribes, the BaPedi (Northern Sotho) and Shangaane currently live. Their people were forcefully removed from their ancestral land many years ago by the Boers (Netherlands) during the European invasion of Africa in the 1500's. These areas were called "home lands", the term used by the former racist "apartheid" regime, which is similar to the term "reservations" used by the European invaders in both Canada and USA. After Nelson Mandela came out from prison in the early 90's, his political party the African National Congress (ANC) has consequently been winning the elections by a large majority of the votes in South Africa and steadily implementing the necessary meaningful changes to create a new non-racial African nation. However the development of these communities like Acornoek has been rather slow and much criticized by the people as the implementation of water supplies, sewerage systems and roads have been minimal in relation to the allocated budgets by central government. Therefore our modest contribution of this community's water development, of course a drop in the ocean, will be however an example of how people can catch free water while waiting for the municipality supply to reach their homes. And when the supply finally reaches their taps, they can then use their reservoirs to store water for their home gardens and as a back of a possible future water system breakdown. Rea Leboha, Nyiabonga, Obrigado, Thanks!!! This is our first community development in the "new" South Africa as we established a base of operation in this country after Nelson Mandela and other ANC leaders were released from prison and the first non-racist democratic elections took place in the country. Many years ago before the Dutch (Afrikaners) and British invaded this part of Africa, the MaShangaan and the Pedi (of Sotho descendence) used to be the two main African tribes living in this area of South Africa for centuries. The European settlers removed these Native People by force from their ancestral land to homelands, what you call reservations in North America. Some of these homelands are located east of the Drakensberg Mountains and two of the main towns are named Acornhoek and Bushbuck Ridge. Most of these African Native people work in the white farmers (aka boers) agricultural farms therefore they have to commute daily between their homes and work place. We are working with a close local friend of ours, Chester Mathebula, a Pedi (Sotho) and resident of Acornoek in the Mpumalanga province. We have employed Chester part time for quite some time assisting us with the up keeping of our Kanimambo Creations multimedia centres. We have thus developed a close friendship with her and family, thus offering us the opportunity of getting to know our new country’s true hosts. Last year we managed to assist Thabo, one of her children, to study computer sciences and look forward to continue our assistance towards her children’s education. This close relationship developed into our decision this year to initiate a pilot project in her village as part of our water & sanitation program, by assisting her household with basic rain water catchment and storage in order to improve the sanitation standards of her family and close relatives, over 12 people in total. They have a municipality water source but is seldom operational therefore we discussed the need to install a large water reservoir in order to both store water from the pipe when it runs and to catch rain water from the roof through a gutter system. Our loyal Native Indian friends from Plenty Canada have approved a basic budget for the purchase of a 4,5000 ltr heavy-duty plastic water tank, gutters, cement, etc, and we have already completed this important project in our area. The above images illustrate the latest project activities in Acornoek.